This 2002 rock fall in Rockville occurred at night and barely missed the resident as the boulder came to rest in the bedroom. 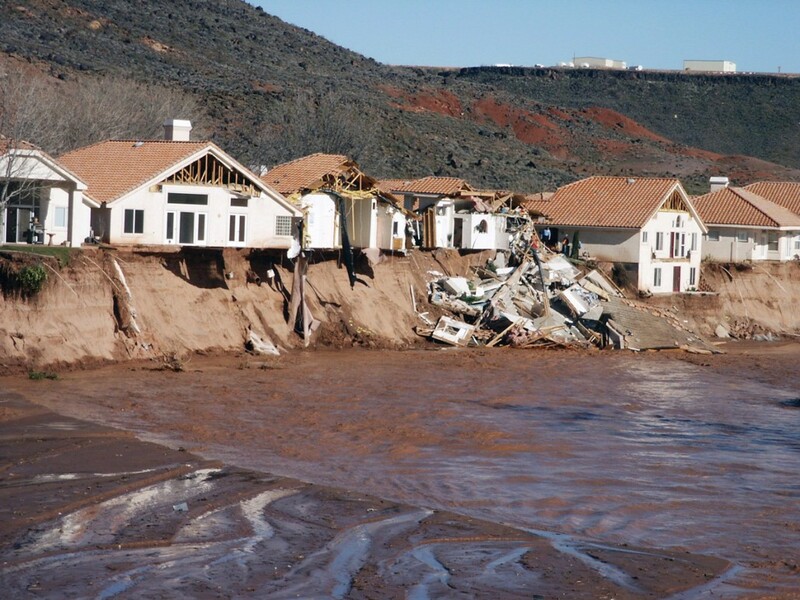 Damage to homes in Utah this year from landslides, rock falls, and floods highlights the importance of considering geologic hazards in residential development. Land-use regulation to help ensure safe development is a responsibility granted to Utah’s local governments (cities, towns, and counties) by the state. Some state agencies offer technical assistance to encourage responsible land use, and the Utah Geological Survey (UGS) is one such agency that provides geologic assistance to help local governments deal with geologic hazards. This technical assistance includes helping to write ordinances, preparing generalized geologic hazards maps, reviewing geologic reports by developers and their consultants, and responding to geologic-hazards-related emergencies and disasters. Many of the geologic processes that have shaped Utah’s rugged and scenic landscapes over the past few million years remain active today. Uplift of the Wasatch and other mountain ranges in central and western Utah is episodic and accompanied by large earthquakes. The resulting steep mountainsides and high elevations are prone to rapid erosion and landslides, and are a source of floodwaters. These are all natural geologic processes, but they are termed geologic hazards when they damage structures or threaten lives. Earthquakes have the potential to inflict a greater loss of life and property in a single event than all other hazards in Utah. Damaging geologic effects of earthquakes include ground shaking, surface faulting, soil liquefaction, and earthquake-induced landslides and flooding. Strong ground shaking represents the greatest hazard during an earthquake because it affects large areas, causes the most damage, and induces many of the secondary effects such as liquefaction, landsliding, and flooding. Estimated losses from a magnitude 7 earthquake in the Salt Lake City area could exceed 1500 lives lost and $15 billion in damages to buildings, including private residences. The landslide hazard in Utah was dramatically demonstrated in 1983 when the Thistle landslide blocked the Spanish Fork River, causing flooding that inundated the small town of Thistle and severed highway and rail connections between the Wasatch Front and areas to the south and east. Although the Thistle landslide was spectacular and cost the state over $200 million, many smaller landslides regularly damage homes. Damages have generally been greatest during periods of abnormally high precipitation such as in 1983, 1984, 1997, 1998, and 2005. 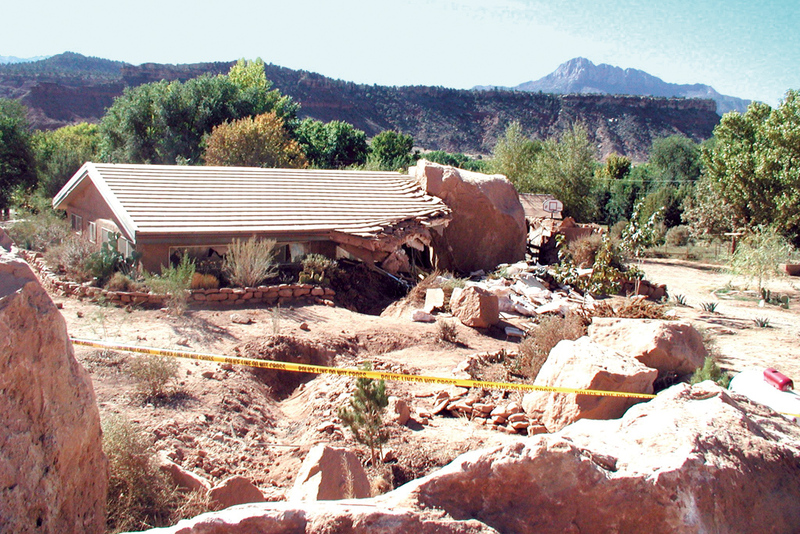 Landslides occasionally cause injuries and deaths; the most recent death was in March of this year when a young boy was buried by a slide from a steep stream cut in Kanab. Utah experiences a wide variety of landslide types, from Thistle-type slides to debris flows (slurries of mud and rocks generated by cloudburst floods and rapid spring snowmelt), to rock slides and rock falls in areas of steep, barren rock outcrop. Snow avalanches also present hazards to homes built along mountain fronts. Several types of naturally occurring materials may damage foundations and pose a threat to permanent structures. Two of the most damaging are expansive and collapsible soils. Expansive clayey soils can swell and generate forces sufficient to crack walls and foundations of relatively light residential structures. 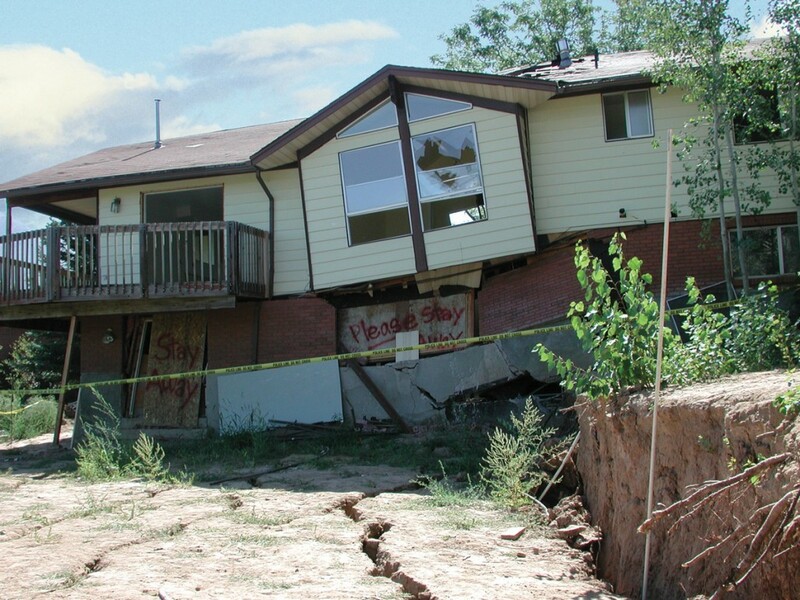 Collapsible soils undergo a volume decrease when wet, inducing subsidence that may cause structural damage. Subsidence may also result from decomposition of organic soil materials and collapse due to piping (subsurface erosion) and dissolution of gypsum, salt, and limestone causing sinkholes. Subsidence and ground cracks caused by ground-water withdrawal have recently been recognized in southwestern Utah (see accompanying article). Shifting wind-blown sands in the more arid parts of the state also present hazards, most recently in the Escalante Desert where shifting sands have encroached on residences and buried yards. 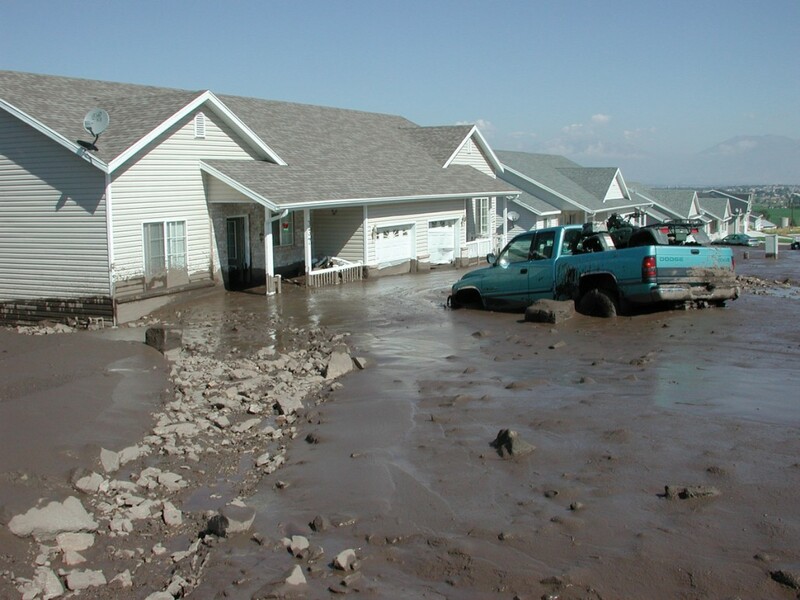 Stream flooding is a widely distributed and frequently occurring geologic hazard in Utah, as demonstrated by the January 2005 floods in southwestern Utah. Spring snowmelt is responsible for much flooding along Utah’s streams, and is to some extent predictable. Cloudburst storms generate more localized but often very destructive flooding and can occur with little warning. Cloudburst storms also cause alluvial-fan flooding, including debris flows, which may affect large areas and cause damage by sediment burial. Another type of flooding that has caused considerable damage in Utah is the rise of lake levels, particularly Great Salt Lake. Flooding may also result from a rise in the shallow water table in response to high stream and lake levels, heavy precipitation, and excess irrigation. Flooding of topographically low areas and subsurface structures such as basements and septictank soil-absorption fields is the major hazard to private residences from a rising water table. For residential development, local governments in Utah address geologic hazards in geologic or natural-hazards, critical-environmental, sensitivearea, and/or hillside-protection ordinances. The purpose of these ordinances is to encourage prudent site development in areas of geologic hazards. The overall approach in addressing geologic hazards consists of requiring developers to perform geologichazards studies to assess hazards and recommend risk-reduction measures prior to subdivision approval. This approach is outlined in the UGS Public Information Series 75 brochure, Using Geologic- Hazards Information to Reduce Risks and Losses – a Guide for Local Governments (http://geology.utah.gov/ online/pdf/pi-75.pdf ). An important step in addressing geologic hazards in an ordinance is to identify hazard areas. Generalized maps typically delineate special-study areas where geologic hazards may exist. The ordinance then requires that developers and their consultants perform geologic hazards investigations to address site-specific hazards and recommend appropriate action prior to development in such areas. One outcome may be that no hazards are found at the site and no action is necessary. If hazards exist, detailed site investigations are performed to determine a prudent course of action. Recommended actions may include setbacks from faults and landslides, slope stabilization, placement of engineered structures such as debris basins, special foundation designs, and disclosure of hazards to potential buyers. In some cases, site abandonment is necessary where risks from geologic hazards cannot be adequately reduced or are too costly to reduce and are best avoided. In the final step, reports of these investigations along with recommendations for action to reduce risks are submitted to the local government and reviewed by qualified engineering geologists, such as the UGS, and geotechnical engineers acting on behalf of the local government and future homebuyers. Reviewers then either determine that the investigations are sufficient and risk-reduction measures satisfactory, or recommend further work to resolve remaining issues. Generalized maps (1:24,000 scale or larger) are used in ordinances to delineate areas where geologic hazards should be considered and sitespecific studies are needed. The UGS produces such maps, and most of the urbanizing areas along the Wasatch Front now have generalized maps specifically prepared for use in local government ordinances. Maps are available to the public from county planning offices along the urbanized Wasatch Front portions of Salt Lake, Davis, Weber, and Utah Counties. Similar maps are available from the Department of Natural Resources (DNR) bookstore and library for western Wasatch County, Tooele Valley, Moab-Spanish Valley and Castle Valley in Grand County, and Monroe in Sevier County. Preparation of generalized geologic hazards maps is also underway by the UGS for the St. George basin, Cache Valley, and Ogden Valley. These maps are not suited for use in local government hazards ordinances except as preliminary guides to potential hazards in areas where more detailed maps are not yet available. The maps are available in hard copy at the DNR bookstore and library, and in digital form in the State Geographic Information Database from the Utah Automated Geographic Reference Center. The UGS assists local governments by helping write ordinances and preparing generalized geologic hazards maps. To help local governments and developers’ consultants ensure that adequate investigations are performed, the UGS has published guidelines for (1) the preparation and review of engineering geologic reports, (2) evaluating landslide hazards, (3) evaluating surface-fault-rupture hazards, and (4) evaluating debris-flow hazards. Geologic hazards reports must be prepared and reviewed by qualified engineering geologists licensed in Utah, generally in conjunction with a licensed geotechnical engineer. To administer an ordinance, local governments should have access to qualified geologists and engineers to perform reviews and to represent their interest in contacts with developers and their consultants. The Salt Lake County geologist provides geologic review services for unincorporated Salt Lake County, and the UGS provides such services for other local governments in the state. Some local governments retain qualified engineering geologists and geotechnical engineers under contract to represent their interests, as is commonly done with the city/county engineer position. The extent to which local governments consider geologic hazards in residential development varies widely among jurisdictions, and has changed over time as well. Check with your local government planning department to find out what ordinances they have adopted and whether they were in force when your house was built. Also, ask how ordinances are enforced and the extent to which geologic hazards reports are reviewed prior to approval. In general, adoption and enforcement is improving with time, particularly in larger communities, as is the technology used in assessing hazards and reducing risks. New subdivisions typically undergo closer scrutiny than many of the older existing subdivisions did. However, homebuyers should not assume that local government approval of a subdivision or building permit guarantees safety from geologic hazards. Also, losses due to geologic hazards are generally not covered by standard homeowners’ insurance policies. A wise homebuyer should check generalized geologic hazards maps and ask the local government to see geologic hazards reports for a subdivision, particularly when contemplating purchase of a home in a hazardous hillside or mountain-front location, to aid in their decision making. If questions arise, homebuyers may wish to have a consulting geologist and/or engineer help evaluate the information and provide advice. The UGS publishes helpful guides for homebuyers and can also help find useful information to aid homebuyers in making a wise choice.